Letting Leafy Greens Into Your Life Once upon a time, Susan Thomas didn't know a mustard green from a mizuna leaf. Now, she can't imagine life without dark, leafy greens — especially Swiss chard. She shares easy and tasty ways to get vitamin-packed greens into your diet. Swiss chard is the new celery. 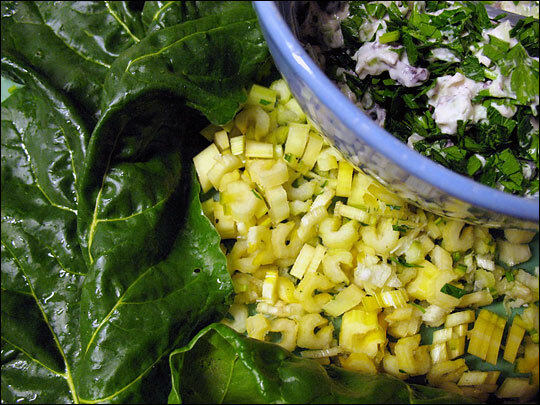 Freshly picked Canary Yellow Swiss chard goes into Swiss chard tuna salad. 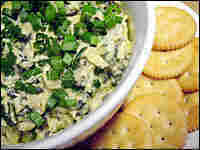 Recipes for Swiss chard tuna salad and hot Swiss chard artichoke dip. The year I turned 30, I had two friends who turned 60, and I took full advantage of the situation. "Save me some trouble," I said, "and tell me the most valuable thing you've learned in the last 30 years." The first one offered up a piece of advice I've tried to abide by ever since. He said, "Be happy, not resentful or envious, when good things happen to other people." But it was seven words of wisdom from the second friend that truly changed my life: "Always plant Swiss chard in the garden." It seems you can't flip through a magazine or newspaper without reading that you should include more dark green, leafy vegetables in your diet. Yet aside from spinach, many people have no idea what these vegetables might be, let alone what to do with them. Before I became a gardener, I didn't know a mustard green from a mizuna leaf — although I did come face to face with kale during a brief stint at a fast food restaurant while in high school. Each morning, the salad girl would fill up the salad bar and then arrange rugged, deep green leaves around the dishes of salad fixings. Each night, she carefully layered the leaves in a container and placed it in the refrigerator. This marvelous stuff, I was told, was kale, and it was so sturdy that the same bunch could decorate the salad bar for weeks. No one ever mentioned that it was edible. 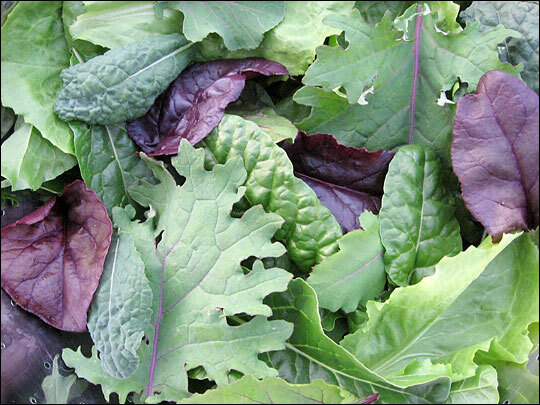 Freshly picked greens — including Swiss chard, escarole, Bull's Blood beet purple beet "greens," Tuscan kale and Red Russian kale — are headed for the salad bowl. Eventually I learned that what people should really be doing with kale is eating it — although "ornamental" kale is very popular among traditional gardeners, something that still confounds me, as the edible kind is lovely. This nutritious, cold-hardy vegetable is now a mainstay in my organic garden. I also raise endive, escarole, mizuna and spinach. I grow beets as much for the greens (which are more often a gorgeous dark purple) as the roots. I have flirted with collards and mustard (which I found too pungent), and am slowly working my way through the numerous types of Asian greens. The easiest way to get your greens is to toss them into salads. All things green and leafy in my vegetable garden are fair and flavorful game for the salad bowl. I pick tender baby leaves from all the young plants mentioned above, as well as chard, turnip, kohlrabi, broccoli and even dandelion leaves. If you are serving picky eaters, try sneaking one new thing into your salad bowl at a time. Trust me, before long they'll complain if you try to switch back to plain lettuce. You can't go wrong if you saute your leafy greens with garlic in some good olive oil. Add a smidgen of anchovy paste to the oil to coax out flavor (it won't add a fishy taste). Throw in a handful of chopped pancetta or proscuitto, and you'll probably receive a round of applause. Variety is good for the garden and the tastebuds, but if I were allowed to grow only one leafy green for the rest of my life, it would definitely be Swiss chard. Food writer and professional baker Susan Thomas is a former California native who now lives on a remote, 240-acre Missouri farm with sheep, chickens, two dogs, seven cats, an adorable donkey named Dan, and one very well-fed farmguy. She shares stories and photos of her crazy country life at her award-winning blog, FarmgirlFare.com. Chard, which comes from the French word carde because it was mistaken for the similar looking cardoon (or carde) appears in the earliest European records of food plants: Aristotle wrote about red chard in the 4th century B.C. A member of the beet family, chard originated in the Mediterranean region, though it eventually came to be called Swiss chard after a 19th-century Swiss botanist named Koch who determined its scientific name, beta vulgaris. Swiss chard is also known as white beet, strawberry spinach, seakale beet, leaf beet, Sicilian beet, spinach beet, Chilean beet, Roman kale, perpetual spinach, silverbeet and mangold — and that's just in English. This nutrient-packed chameleon of the vegetable world comes in a variety of colors and is a superb, year-round stand-in for lettuce, spinach and celery. When the spinach is suffering from heatstroke, or the lettuce is keeling over from frostbite, my hardy Swiss chard doesn't even flinch. Swiss chard is bursting with nutrients, including vitamins K, A, C and E, plus several B vitamins, magnesium, manganese, potassium, iron and dietary fiber. It is a good source of calcium and contains promising cancer-fighting properties. Throughout history, various parts of the plant have been used to treat everything from ulcers to dandruff. But more importantly, it tastes delicious. You'll find bunches of Swiss chard in supermarkets year-round, but freshness and quality can vary greatly. Peak season in most areas is from June through October, though in milder climates you often can find interesting varieties of just-harvested bounty at farmers' markets from early spring until late fall. Look for crisp stalks with shiny, unblemished leaves. 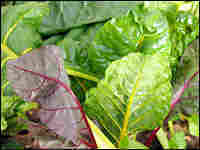 You can use Swiss chard (and most other greens) in place of spinach in virtually any recipe. Try it in lasagna, ravioli and quiche — or even your favorite stuffing. Toss it with pasta or add thin strips to stir-fried rice during the last few minutes of cooking. Mix chopped fresh chard or kale into pizza sauce or scatter over homemade pizza before adding the cheese. Stir sliced leaves into soups, and slip steamed greens into scrambled eggs, omelets and frittatas. You can even steam Swiss chard stalks and eat them like asparagus. The only drawback to leafy greens is shrinkage during cooking. You'll need what seems like an enormous heap to feed five or six people, and if you're serving more than that, you should probably stick to salad. The upside is that cooking down your greens means you'll be left with plenty of room to let more of them into your life, which I intend to do for at least the next 30 years. Sowing: The tastiest Swiss chard you will ever eat is that which you grow yourself, and fortunately it is easy to cultivate. The plants are also pleasing to the eye, so you can tuck a few almost anywhere. Swiss chard does exceptionally well in containers, which means even apartment dwellers have no excuse not to try growing some. Containers should be at least 12 inches deep and 12 inches across; three or four plants will fit comfortably in a 14-inch-wide pot. A packet of Swiss chard seeds will set you back only a dollar or two. Fordhook Giant, introduced in 1924, is a popular variety with large, dark green leaves and white stems. I grow it along with more unusual varieties such as Pink Lipstick and Canary Yellow, whose brilliant yellow stems are stunning. This year, I'll be trying a few new kinds in the garden, too: Vulcan, an improved rhubarb chard developed in Switzerland; Sea Foam, said to have great flavor and texture; and Orange Fantasia, which boasts light icy green leaves and bright orange stalks that hold their color when cooked. Can't make up your mind? With Five Color Silverbeet, an Australian variety often sold as Bright Lights or Rainbow Chard, you'll get near-neon shades of pink, yellow, orange, red and white chard from one packet. Young Pink Lipstick and Canary Yellow Swiss chard grown in the author's greenhouse. Growing: Before planting, soak Swiss chard seeds in warm water for 15 minutes to speed up germination. Sow seeds 1/2-inch deep and a few inches apart directly in the garden when the soil is at least 50 degrees F.
Or sow them indoors anytime in standard-sized, 10-inch-by-20-inch plastic flats of individual plugs filled with a soilless seed starting or potting mix (place 1 or 2 seeds in each plug); transplant seedlings into the garden when they are 2 to 3 inches tall. Thin seedlings so they are 4 to 5 inches apart — or 8 to 10 inches apart if you plan to only harvest the outer leaves. Plants do best in full sun but will tolerate some shade. They can endure light frosts in spring and moderate freezes in fall (though tiny seedlings are more tender). My Swiss chard has withstood temperatures well below freezing protected by nothing more than a piece of heavy plastic or an old sheet, and it thrives during harsh winters in my unheated, raised-bed greenhouse. Maintenance is minimum: Mulch your plants with compost and/or grass clippings to add nutrients and discourage weeds, and use a natural fertilizer such as kelp or manure tea (a must for container growing). Provide moderate, even watering. (As a rule, properly moist soil will crumble evenly into small granules when you grab a handful and squeeze it.) Most pests ignore Swiss chard, though ravenous deer have happily munched down my entire crop. Harvesting: Swiss chard is a "cut and come again" plant, which means that one crop can supply you with beautiful bounty for months. Growing your own also allows you to enjoy the tender baby leaves, which can rarely be found for sale. You can either continually harvest just the outer stalks (scissors work great; start tossing the tender leaves into salads when plants are about 6 inches high) or cut whole young plants off an inch or two above the soil and wait for them to regrow. Read last week's Kitchen Window: polenta. This flavorful twist on classic tuna salad uses chopped Swiss chard stems in place of celery and a few chopped chard leaves for extra green goodness. Choose a variety of chard such as Canary Yellow or Oriole Orange and you'll get extra color with your crunch. Any type of olives would be tasty in this — cracked green, oil cured, even the plain old canned black ones. Chopped purple onion in place of the scallions would be very nice. If you have a chance, mix up your tuna salad and let it sit in the refrigerator at least a few hours before serving; it'll be even tastier. Put it on sandwiches, stuff it into pita bread pockets or spread it on crackers. 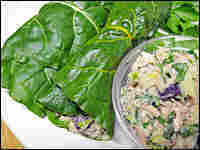 For a low-carb lunch or snack, use Swiss chard leaves in place of tortillas to make easy tuna wraps. Feeding a crowd? Just double the recipe. Combine mayonnaise, Dijon mustard, balsamic vinegar and olive brine in a small bowl and mix well. Stir in tuna, chopped Swiss chard stems and leaves, parsley, and scallions. Salt and pepper to taste. If desired, spread out extra chard leaves, spoon tuna salad along the lower edges, then roll up to make low-carb wraps. Tuna salad will keep for three days in the refrigerator. My version of the popular spinach artichoke dip is cooked on the stovetop instead of in the oven and uses chopped fresh Swiss chard leaves and stalks in place of frozen spinach, along with plenty of onion and garlic for extra flavor. It tastes even better if you make it a day ahead and reheat it just before serving, either in the microwave or on the stovetop (you might need to add a splash of milk when reheating on the stove). You can use reduced-fat cream cheese and mayonnaise, as well as low-fat sour cream, if desired. This addictive stuff goes well with practically anything: crackers, tortilla chips, toasted or untoasted sourdough baguette slices, fresh veggies, pita chips, even pretzels. Don't be afraid to think beyond the dip bowl, either — try putting it on baked potatoes or slipping some into an omelet. I even like it cold.